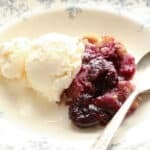 Cherry Flop was my grandma’s claim to fame in the kitchen and it was her go-to dessert recipe. Grandma was not known for her cooking and baking skills, but she pulled this cherry dessert together for company for more years than I can remember. As the story goes, she misread the directions the first time she made it and the crust flipped over onto the top of the fruit. However, it came to be made, “cherry flop” was a hit and she continued making it the same way. I used fresh sweet cherries to make this dessert, but my grandmother made it for years using canned cherries. Please note that Grandma made her Cherry Flop with plain cherries canned in water, not cherries in heavy syrup, and not cherry pie filling. It works great either way, but I do recommend taking advantage of the fresh cherries while the season lasts. I’ve adapted her original recipe to make the most of the sweet cherries that are in season so briefly and I’ve added a splash of almond extract because it is a perfect match for the cherries. As with most of our desserts, I’m also giving you both the gluten-free recipe and the traditional version. Served warm, with a scoop of melting vanilla ice cream on top, this is an awesome summer dessert! For more desserts made with fresh cherries, these Cherry Coconut Bars and this Roasted Cherry Chocolate Ice Cream are both favorites here. Very Berry Cherry Pie, Black and White Cherry Brownies, Almond Cupcakes with Fresh Cherry Frosting, and these Chocolate Cheesecake Cherries are all on my must-try list with this season’s cherries. Preheat the oven to 350 degrees. Place the cherries, sugar, and water in a small saucepan and bring to a boil. Reduce the heat to medium and simmer, stirring frequently, for 12- 15 minutes, until the cherries have softened and the sugar water has thickened a bit. Remove from the heat and stir in the almond extract. While the cherries are simmering, stir together the sugar and butter in a medium-size bowl. Whisk the milk into the bowl with the sugar and butter, then add the flours and baking powder. Pour the batter into a 10″ square or 6 cup casserole dish. Spoon the cherries across the batter and then drizzle with the syrupy water from the saucepan. Bake for 40 minutes, until a toothpick inserted comes out mostly clean without any wet batter on it. Scoop the warm cherry flop into bowls and top with vanilla ice cream. 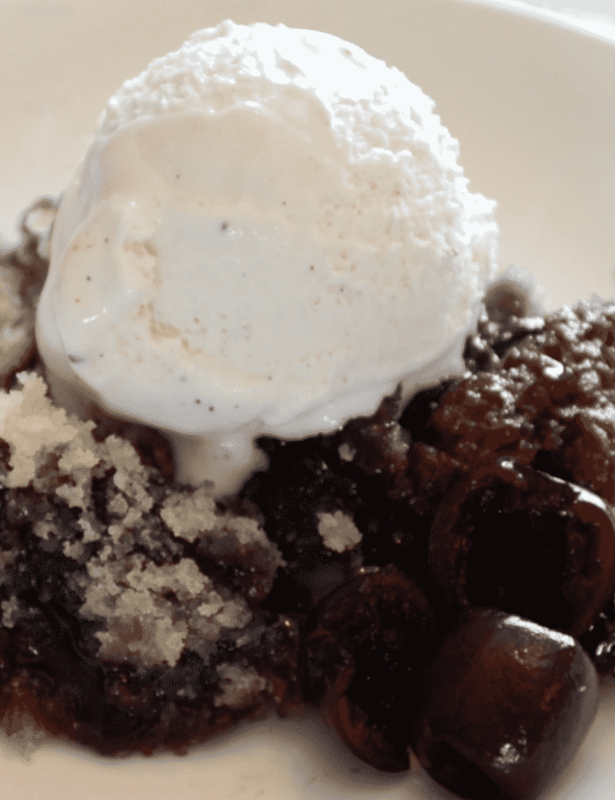 Grandma's Cherry Flop recipe is a favorite family dessert! While the cherries are simmering, stir together the sugar and butter in a medium size bowl. Whisk the milk into the bowl with the sugar and butter, then add the flours and baking powder. Pour the batter into a 10" square or 6 cup casserole dish. Spoon the cherries across the batter and then drizzle with the syrupy water from the saucepan. Bake for 40 minutes, until a toothpick inserted comes out mostly clean without any wet batter on it. 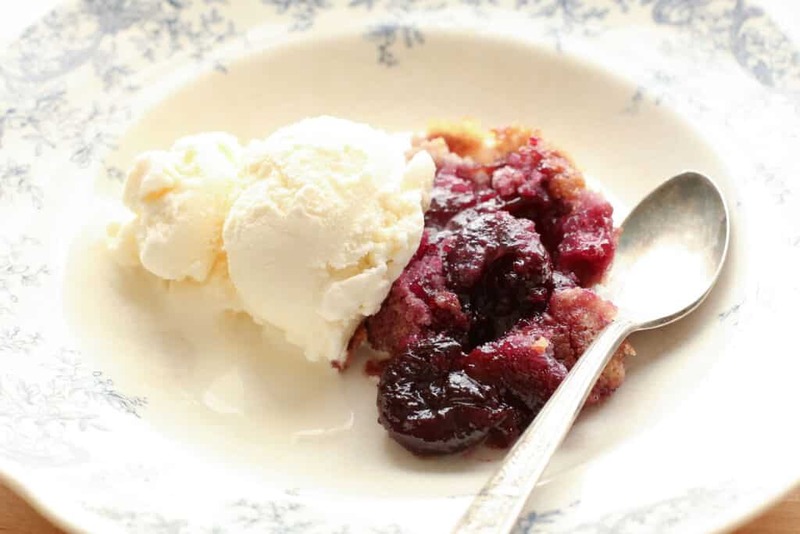 Scoop the warm cherry flop into bowls and top with vanilla ice cream. Enjoy! I could most definitely eat the whole pan. This may have been considered a flop but I think it is a Winner. Thanks for the recipe. I love this Mary,what a great story! This looks so yummy! Fresh cherries are available in my area right now. Can't wait to try this. Thanks for sharing your recipes with us. What about frozen cherries? If so they have to be defrosted?Thank you. I think frozen cherries would work fine. You're going to cook them on the stove, so there's no need to thaw them first. I love that you use fresh cherries in this recipe, Mary! Delicious. 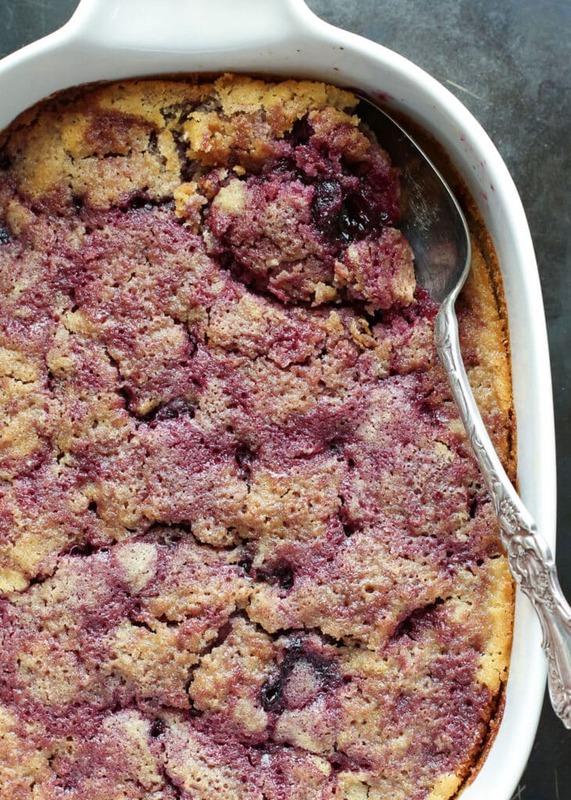 If I used almond flour or pamela's baking and pancake mix work just as good in this recipe? Your grandma must have been a really cool person. I think a gluten-free baking mix should work nicely for this particular recipe. I wouldn't recommend coconut flour without some other starches added it to limit how much liquid it absorbs. If you don't need a GF recipe, you can use all-purpose flour instead. I am new to Celiac disease. Thank you for the recipes.